This drink almost reminds me of Yoohoo. Remember that stuff? You know, the self proclaimed "chocolate drink"? I was always puzzled as to what exactly a "chocolate drink" was. Because clearly it wasn't milk. It sat on room temperature grocery store shelves for who knows how long, never expiring really. But jeez did I love Yoohoo as a kid. I remember my friend and I attending a Warped Tour during high school and heading back, over and over again, to the Yoohoo tent to refresh ourselves after all that pop punk rock festival-ness. Because you know, nothing hydrates you more after hours of jumping and dancing in the desert heat, than a nice 90°F paper cup full of "chocolate drink". I'll tell you what it DID do- give us lots of sugary energy! 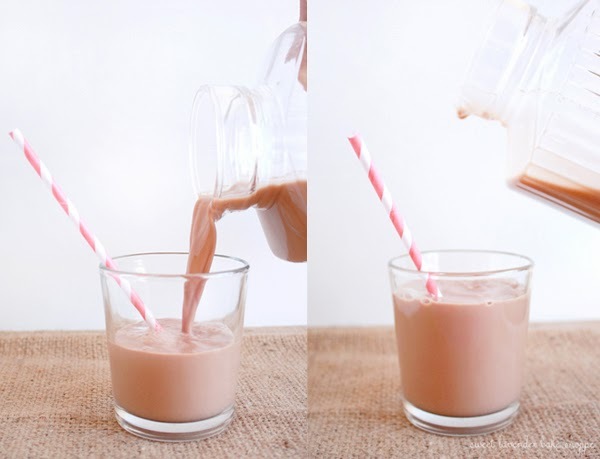 I guess this recipe could be called "chocolate drink". It's not milk. There's no dairy. Eh. Naaaaw. By definition it really is an almond milk. So "milk" it shall be called. It certainly is not Yoohoo's definition of a chocolate drink though, ingredient-wise. Why oh why Yoohoo, didn't you make your stuff like this??? It would have been SO much better for us all!!! I would have drank myself to oblivion! Anyways, I'm happy to be have an unprocessed version now! My inner child rejoices! Each sip takes me back to when I didn't care what I put in my body, haha, but with the happy feeling that what I am actually consuming is indeed good for me. Not like when I was younger: Flaming Hot Cheetos? Yes! All day, everyday! Extra Cheesy Nacho Dorritos? Why not? Squirt, Cherry Coke, and Mountain Dew Slurpees? For sure! All of those within a 12 hour period? Uhhh, duh! 1. In a bowl add your almonds, vanilla, honey (or maple) cocoa powder, sea salt, and boiling hot water. Mix together and cover tightly with a lid or plastic wrap. Allow to sit on counter for 4 hours. 2. Next, add your bowl of soaked almonds and flavored water to a blender or food processor. Puree on high until frothy, white, and creamy- about 2-3 minutes. 3. 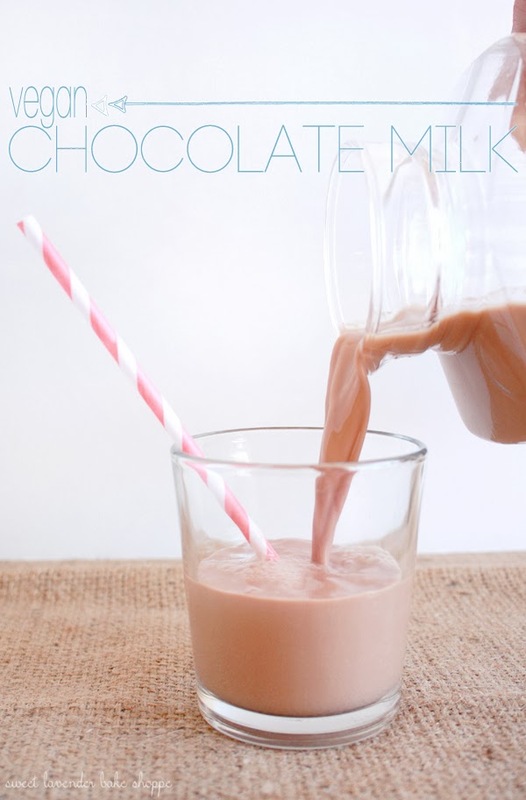 Pour entire mixture into a large bowl and add remaining 4-5 cups of filtered water, depending on how sweet you want your chocolate milk. Whisk and stir together- making sure to really break up the almond puree that was created while blending. Let sit 5-10 minutes. I suggest starting with 4 cups, finishing recipe, and then tasting. If it's too sweet for your liking, simply add another cup of filtered water at the end. 5. Slowly pour or spoon your almond mixture through the sieve (and possible cheesecloth) into your large bowl. When all the liquid has been added, press your almond meal with a spatula against the sieve, to get out even more liquid. I did this with a rubber spatula- just gently but firmly pressed over and over all around the almonds. You'll be surprised how much more liquid is in those babies! 6. When you feel you've adequately pressed, get out a clean/dry tea towel and dump your almond solids into it. Remove cheesecloth (and discard) if you used, and wrap towel up like a package. Over your bowl of milk, squeeeeeeeeze and twist your towel! Yep, even more liquid will come out! I had my husband do this part because he's WAY stronger than I am! 7. 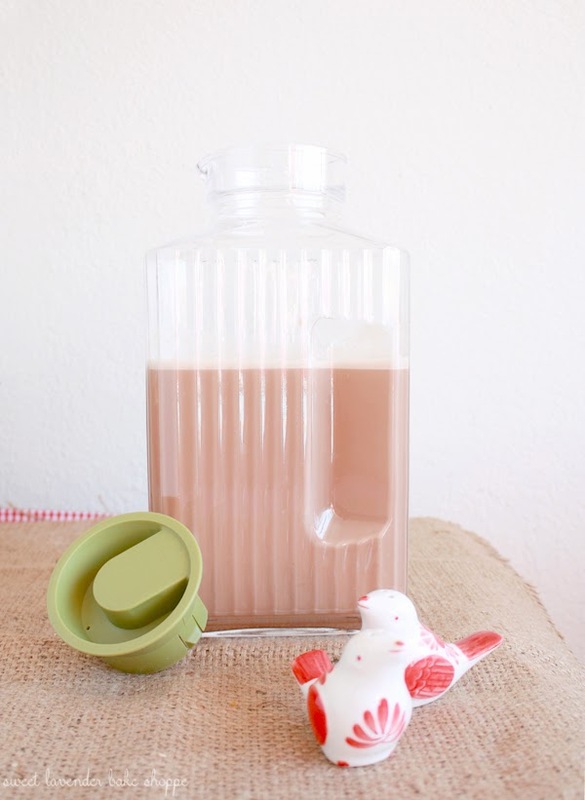 Finally, carefully pour your milk into a pitcher and store in the fridge for up to one week! Make sure you shake before using, each time. MmMmmMmm! Slightly sweetened with unrefined sweeteners, dairy and gluten free; you can drink this stuff guilt-free. I've literally been pouring this drink into everything I can get my hands on! Well that and also drinking it straight out of the container from the fridge. Ooops! Shhhhhh. From my tea/coffee in the morning...oatmeal and/or granola...pancake batter...smoothies...seriously...perks up everything! Also, I'm just so proud of this little thrift store find, guys. For $5, my husband and I purchased a brand "new", totally vintage, glass pitcher! Not only that, but the thrift store we bought it from donates 100% of proceeds to feeding families around that community! Wheeeee! Ooh, this intrigues me so much!! Do you have to have an super awesome blender to this? Mine isn't the greatest but manages to blend my smoothies alright. I'll adding these ingredients to my grocery list right now. Oh, and that thrifted pitcher is amazing, I love finds like that! Hey Chantel! Your blender should be powerful enough to break up soaked nuts. Which I'm pretty sure most blenders are :) If your isn't the strongest, I suggest blending for a while longer than mentioned in this recipe.